Haverford, Pennsylvania | November 17, 2010 | Elizabeth B. Chesick, retired Chairwoman and Physics Teacher at The Baldwin School, has been recognized by Elite American Educators for her experience, dedication and leadership in physics education. 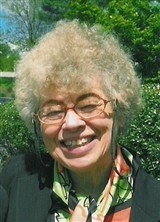 Prior to her retirement, Ms. Chesick taught physics and physical science, including high-energy particle physics, for The Baldwin School, a private college preparatory school for students grades kindergarten through 12th. As chairwoman of the science department, Ms. Chesick was responsible for managing departmental and school associated administrative, curricular and guidance responsibilities. She also revised the curriculum, performed laboratory experiments, and conducted computer programming. Attributing her success to her passion for education, Ms. Chesick’s greatest accomplishment thus far has been receiving the Presidential Award from the state of Pennsylvania in 1988. Ms. Chesick chose a career in education because of the influence from her family, all of whom were involved in education. Her greatest influences were her father, Moffat Grier, a mathematics professor and her physics professor at Wellesley College, Phyllis J. Fleming. As an educator, Ms. Chesick enjoys interacting with her students and having the opportunity to run her classroom the way she chooses. An easy going person, Ms. Chesick advises others in her field to follow through with their goals and ideas in order to succeed. Ms. Chesick earned a Bachelor of Science in physics from Wellesley College in 1956, a Master of Science in physics from Tufts University in 1958, and completed coursework in computer ccience plus 20 credits at the University of Southern California in 1980. She retains affiliations with the Southeastern Pennsylvania Teachers Section of the American Association of Physics Teachers and the National Association of Science Teachers. 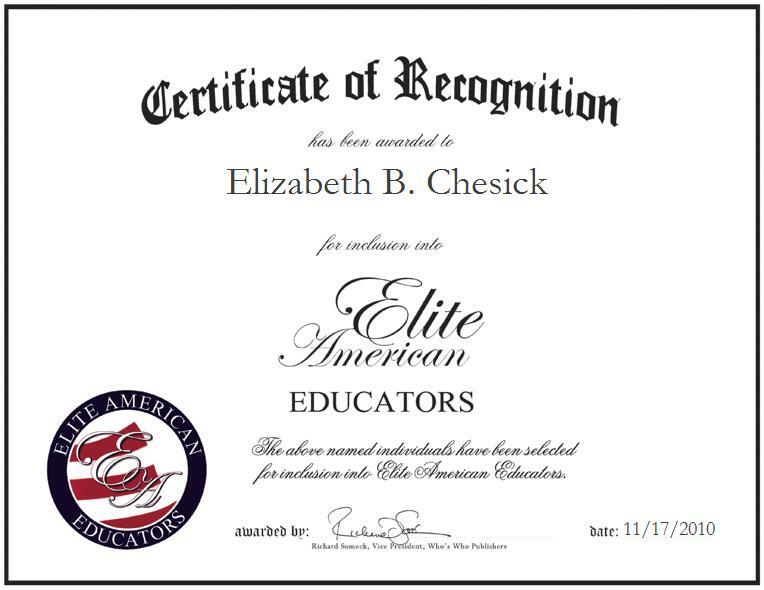 Diligent in her work to ensure her students learn and succeed, Ms. Chesick has been honored from various sources for her dedication to education, including Top Industry Expert in Education for 2010-2011 and Outstanding Professional for 2009-2010 from Cambridge Who’s Who® Publishing, Recognition Plaque for Service to Southeastern Pennsylvania from the American Association of Physics Teachers in 2005, Rosamond Cross Chair for Excellence in Teaching from The Baldwin School in 1997, Tandy Technology Scholarship in 1992, and Agnes and Sophie Dallas Irwin Grant for Studies in 1980. She lends her skills and abilities to various charity organizations as a volunteer including Family Promise and Philanthropic Educational Organization for Women and volunteers as a co-coordinator and board secretary for Bryn Mawr Presbyterian Church for the Interfaith Hospitality Network – Main Line. For more information about Elizabeth Chesick, please visit her personal website at http://www.elizabethchesick.com.